This product is Cheapest price, available for sale from China without tax go through During 2018's Christmas day, Purchase from China Electronics wholesaler: www.saleholy.com My Blog: http://www.wholesalechinaphone.com General Features 13.3" Retina IPS Display With four times as many pixels as an HD display, the 13.3" Retina IPS Display provides up to 48 percent more color than the previous generation. The Retina Display has a 2560 x 1600 screen resolution and a 16:10 aspect ratio for 227 pixels per inch (ppi). The display glass goes right to the edge of the screen, making the bezels 50 percent thinner than before. Touch ID The advanced security and convenience of Touch ID is built into the MacBook Air. Simply place your finger on the integrated Touch ID sensor and your MacBook Air unlocks. Use your fingerprint to immediately access locked documents, notes, and system settings. You can also use Apple Pay securely during checkout while online shopping. No need to enter shipping or billing info, and your card details are never shared. Apple T2 Security Chip Introducing the Apple T2 chip, a second‑generation custom Mac silicon designed by Apple to make MacBook Air even more secure. The Apple T2 chip includes a Secure Enclave coprocessor that provides the foundation for secure boot and encrypted storage capabilities. It also consolidates many discrete controllers, including the system management controller, audio controller, and SSD controller, into one. And the Apple T2 chip brings a familiar voice to MacBook Air - Hey Siri is always ready to open apps, find documents, play music, or answer your questions. 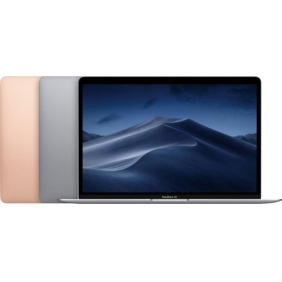 Performance The MacBook Air features an 8th Gen 1.6 GHz Intel Core i5 dual-core processor. It also has 8 of onboard 2133 MHz LPDDR3 RAM and a 256GB PCIe-based SSD. Keyboard The keyboard features the butterfly mechanism, which provides four times more key stability than a traditional scissor mechanism, and has greater comfort and responsiveness. And individual LED-backlit keys with an ambient light sensor help you type in low-light environments. Force Touch Trackpad The Force Touch trackpad lets you interact with your MacBook Air in a variety of ways based on subtle differences in pressure. You have precise control and a uniform response — no matter where you click the trackpad — as well as plenty of room for Multi-Touch gestures, like pinch and zoom.